That isn’t a typo! This is Chicken Styl-ee Seitan. Perfect for where ever someone might use a chicken. I know, people sometimes eat chickens, weird right? PS This recipe was designed for the Seitan & Waffles. But you can use it in anything, of course! ~ For the most chicken-y seitan, use an unchicken broth, like Better Than Bullion brand. Fill a stock pot with the broth, smashed garlic and bay leaves, cover and bring to a boil. In the meantime, together the vital wheat gluten, nutritional yeast and chickpea flour and salt in a large bowl. Make a well in the center and add broth, soy sauce, and olive oil. Mix with a fork and then use your hands to knead for about 3 minutes, until it’s a firm dough and everything looks well incorporated. Divide into 8 even pieces. An easy way to do this is to divide the dough in half, then divide those halves and then divide those halves. Ta-da! 8 pieces. Stretch each piece into a cutlet, pressing the cutlet into the counter to smooth the surface. Let rest until the broth has come to a full boil. Once boiling, lower the heat to a simmer. This is important, the broth should not be at a rolling boil or you risk the seitan getting water logged (AKA turning into brains) Add the gluten pieces and partially cover pot so that steam can escape. Let simmer for 45 minutes, turning occasionally. Make sure to keep an eye on the heat, because it may start to boil again, in which case, just turn it down a notch to keep at a slow, steady simmer. When seitan is done, you can let it cool right in the broth, or remove a portion to use right away. Once cooled, keep stored in a tightly covered tupperware container, submerged in broth. Do you have a suggestion for the leftover broth? I’ve yet to make my own seitan because I both am uncreative and can’t bring myself to throw out the remaining broth. Thanks, Isa! You rock! I’ve not made seitan, though one use for leftover broth might be to use it for cooking rice. I do this with liquid leftover when I cook beans and chickpeas, even black bean liquid. I have never been able to get the hang of simmered seitan. If I were to steam this, how long should I steam it for? Thanks for the recipe Isa! I have been wanting to make my own seitan for some time now and I’ll try this weekend. Could you clarify when the onion powder and sage are added, or does it even matter? I love this. I made seitan for the first time with this recipe. It was super easy! I don’t know why I use to buy this stuff. The texture and flaour were spot on! Jules- last time I made seitan I used the leftover broth to make the lentil soup in Veganomicon. Found great way to practice my fake-chicken-making skills. I make baked no-chicken nuggets! You know, this werid nuggets made with bird corpses are sometimes extended with starchy stuff, so if my corpse-free nuggets are a bit brainy and starchy, they still taste, well, like nuggets. Just like cheap nuggets or like higher quality nuggets, but it still is what it says. Hell, “everything tastes like chicken”, so why it’s so hard to make a vegan thing tasting like chicken?! It’s not fair. I know you’re asking Isa, but when I make seitan I make the broth into gravy and pour it over the seitan. After you simmer the stuff, take the broth, add some black pepper and taste it. If its bland, add more of the spices you put in the seitan, .5 t of each I’d guess, but I don’t usually measure. Then add 3 Tablespoons flour to a little bit of water in a cup, mix it up till theres no chunks, and add it to the broth. Bring to a boil, 5 min, stirring. Then simmer on lower temp till thick-ish. Turn off heat and let stand 5-10 more min. and it will be all the way thick. Never waste the broth again, make some chicken/garlic gravy for your seitan! Thanks to a vegan slow cooker cook book, I’ve found a fool proof way to simmer seitan; on high in the slow cooker for about 3 hours. Works like a charm. I’ve used the left over simmering liquid as liquid for gravy or even to add in place of broth in a stew or soup recipe. Only thing I’d add to what jenn says is that I’d use almond or soy milk instead of water; I’ve found it makes the gravy creamier. Can’t wait to try this seitan recipe. I finally got around making this Seitan with excellent result! Will be making more and experimenting with different flavors too. I never knew making this could be so easy. From now on home made seitan it is! Love it. Made the waffles this morning, very good! Need some time to brown, but neither my husband nor I could eat just one. Had to have more. We are not vegans (yet), just trying some good plant based recipes to improve our health as we age (mid fifties) and SO Glad I found this website! Amy, have you tried Bragg’s Liquid Aminos? It tastes better than soy sauce (at least for me, I think it’s more flavorful) and it soy free. I use it in place of soy sauce or tamari. It’s amazing. Oops! Bragg’s Liquid Aminos is a great product, but it’s made from soy. Interesting, never thought of mixing the gluten with something else than spices before. Sounds like something I have to try next time 🙂 Thanks for the great recipe! Thank you, thank you, thank you for Isa Does It! 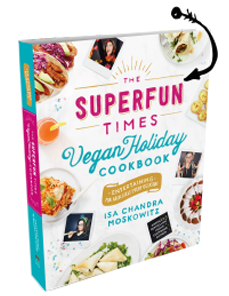 I’m cooking my way through and enjoying every single dish….you are an awesome cook and have been my salvation in my vegan lifestyle! This was a success! I didn’t use it for the intended purposes of fried un-chicken though. I marinated small pieces (along with a bunch of veggies), skewered them and stuck the skewers on the grill. Non-veggies loved it too! Grills up very well, and has a great texture. Anyone frozen this successfully after making a large batch? Thanks, @Ruchama! Love the slow cooker idea. I’ve always had good luck with Isa’s seitan recipes, but it is kind of a pain to monitor things so the broth doesn’t boil, and given my attention span, I’m always in danger of walking off and doing something else, leaving all my hard work to cook down into brainy mush. I’m a body builder competitor and in the past 4 months I’ve gone vegan, so I’ve been exploring the nutritional background of seitan in all its prep states. I’ve read info about seitan lacking complete aminos and that the simmering broth (with soy) adds the lysine addition. I don’t like that I can’t account for the carb contents of the simmering broths into my macro-counting, so I’ve been adding coconut aminos (I prefer it over actual soy products) to my actual wet ingredient portion of my recipes, then I steam my pieces after I’ve sectioned and weighed the pieces for macro accountability. Am I still achieving the activation and addition of lysine into my process? How densely packed should the gluten be in the cup? Is there a weight measurement that I could use instead? Wow! These were so yummy! We cut them into 1 1/2 in squares to have “chik’n” nuggets, but they expand so much in the water they were like chik’n strips. We will definitely make this recipe a keeper! When I want to make cutlets I roll the dough into a tube shape and use a scissor and cut into the circles and then squish them. works great and you get a nice cutlet shape. Hello everyone, I have been trying to eat vegan for about 2 months. Although I like edamame and soy nuts could not get used to tofu. Have been seeing recipes for seitan and decided to try this Recipe today. I thought I had ground the chickpeas into flour and measured and threw into mix. after adding the wet ingredients started to mix. Turned out I had tiny little pieces of chickpeas in the dough. Couldn’t threw it away so continued with recipe. When done I took piece out floured,fryed and Made vegan gravy from broth. Poured onto mashed potatoes and could not believe how good this turned out even with mistakes. Ty Ty Ty Now can’t wait to make the sausages. try using the leftover broth to make risotto the next day. (Seitan-)Huhn mit Pflaumen bzw. Zwetschgen | Hail Seitan! or Can't believe it's not that blahblah jesus guy! Can you bake it instead? That’s what I’m wondering. The reason is rather odd, for me. I’m a wildlife rehabilitator and work at home. I have a countertop electric stove. During spring and summer, it’s baby bird season, and they need to be fed very frequently. So I cover the stove with towels and put their “nests” on that surface with adjustable heat sources above them. It’s just easier for me: less steps to get to the kitchen than the bird room, and the kitchen’s also where the refrigerator, washable floor and hot water/sink are. So I don’t get to see my stove very often, it becomes more like a pale memory… I either use my microwave or the oven. I’m thinking that we’re supposed to keep the simmer low so we don’t get “brains” anyway… I’ll have to think about what temp to set the oven, and how long to cook, though. Probably somewhere between 300 and 350, I would guess… medium heat, and I’ll use my Le Creuset Dutch oven with the lid. Meat-eaters braise dead animals in their ovens at that temp range, low slow cooking to tenderize tough flesh. What could go wrong? As long as I don’t boil, right? The website’s recipe has been recommended to me by several sources. I’ve been searching for one that adds chickpea flour, which is what the store-bought used at Trader Joe’s, but they don’t sell it any more, can’t find a manufacturer to meet their specs, and the other brands I’ve tried are either offensively salty or disgustingly greasy. I’ve been vegetarian since 1972, and sometimes need a change from tofu, much as I love it. I think it will turn out okay, a brief learning curve for me. I must know that this website’s recipe seems ideal, and came recommended. Does anyone know if I can use regular flour instead of chickpea flour? I have tons of unbleached all purpose flour and hate to buy chickpea flour for only this recipe. Anyone do this and have good luck with the results? Pam G, when you make the cutlets do you form them into patties before you cook the seitan or once it’s done? Using white AP flour rather than something like chickpea or pea flour is kind of redundant, for lack of a better word. White flour is where the vital wheat gluten comes from, but the work of extracting the gluten has already been done for you, when you buy vital wheat gluten. The original recipe from years and years ago would tell you to use AP flour, and keep kneading and rinsing it under running water until just the gluten is left behind, but it’s so much easier to just buy the vital wheat gluten, as this recipe calls for. The work has already been done for you. So adding more flour wouldn’t tenderize it the way chickpea or pea flour will. That’s just a guess, on my part. This sounds good. I’m going to have to try this one. My Fiancee is vegetarian so I’ve been using seitan for some time now and always like new ideas. I have never used chickpea flour before and am excited to taste this one. thanks! I made this last night and have not used it in any dish thus far because I have been eating it like jerky. After it came out of the broth, I put it on a foil-lined pan with just a little oil and baked it at 350 for 30-40 mins. I like mine a little on the chewy side. I have been trying to make the perfect seitan since I was in my 20s. I am now in my 40s and I think I’ve finally done it! Thanks so much! Update. I finally ate this the way I was supposed to, in a stew. I figured it would rehydrate in the stew. but many of the pieces were a bit rubbery. It so much more flavorful after it was baked though. I think I’ll bake it 30-40 mins for jerky and either skip the baking altogether or bake for 20 mins at 300-325 to make a stew. This seitan fell apart. I have not had this problem before. No sure what the issue is. This is the best out of three recipes I have tried. It is absolutely amazing and I use every time I make Seitan. I make orange chick and sloppy joe’s with the gluten, then I use the broth as a miso; adding tofu, seaweed and green onions. Thank you Post Punk Kitchen! mine turned out looking a little “brainy” but sliced and fried for your stroganoff- delicious! Thank you so much for the slow cooker idea, ruchama burrell! This was so easy to make and I can’t wait to have it again! About 3 hours on high in my slow cooker was perfect. I then followed this recipe for yummy smoky maple seitan. The technology mixed up in design rice cookers is far more complex versus the original bamboo baskets. Much advancement has been made over the past few decades and it sounds as if the research is continuing to increase the performance and convenience of this popular appliance. A love note to this seitan recipe. Thanks Isa! My first homemade seitan! I’m not sure that I nailed it but the texture was great. This is the absolute best fake chicken recipe by far. The recipes I’ve found elsewhere and the ones that are usually printed on the vital wheat gluten packaging usually lack flavor or have awful textures. This is the ONLY recipe I use to make fake chicken and I use it all the time. I receive many compliments on this from vegetarians and carnivores alike. Oh wow, I just got done making this and it’s SO GOOD! I’ve been thinking of all the ways I could finish it off (tacos, battered nuggets, etc) but I can’t stop eating it straight out of the pot. I went for the slow-cooker method: 3hrs on high. Heavenly. Thank you!!! o what a great idea about making the broth into gravy!! I’m going to make chix with biscuits and gravy with the left overs. I was looking for the garbanzo bean flour in the local Indian grocery, and somehow wires got crossed in my head. Due to the dizzying options of alternate flours, I falsely recalled needing LENTIL flour instead of chickpea. The closest thing they had was yellow split-pea flour, so I bought that. It wasn’t until I was measuring all the ingredients and had the broth on the stove that I realized I bought the wrong flour! So I just used the dahl flour and hoped for the best. Luckily it turned out pretty well. My seitan came out very firm and meaty. It definitely had some denseness and chew — it tasted more like a cross between chicken and beef. If you have had any of the canned meatless products like Worthington, the flavor reminded me of Fri-chik — a chicken sub. It was much better though. I sliced one of the cutlets into “fingers” and dusted the outside with a blackening spice I made up. I then sauteed it in a generous amount of olive oil. When they were crusted accordingly, I coated them with barbecue sauce and let it all carmelize in the pan. It got good crunch and was very flavorful. Last night, I rubbed a couple of the cutlets with jerk seasoning, squeezed a lemon over the whole thing, and covered it with a little broth. I plan on baking those in the oven. I made tofu this way last week, but I think seitan will make a better base. Fingers crossed. Can I just say that this smells AMAZING when it’s cooking to me? I was hungry while making this, and every time I lifted the pot to flip the cutlets I drooled. It’s the sage for sure. Ok, so the jerk chick’n didn’t come out quite right, but my husband LOVED the flavor. It dried out in the oven, partially because I cooked it on a cooling rack (juices drained away) and partially because I baked them with zero oil. Not on purpose — I completely forgot! Double doh! Next time I will saute. To those who are wondering how to use up the broth, it’s simple. If you are making a grain ( rice, cous cous, quinoa, etc. ), greens (cabbage, kale) or a legume/bean (lentils, etc.) as a side dish, cook it in the leftover broth. I used some of my broth to make curried lentils (worked beautifully, and the garlic infusion kept me from having to peel more garlic! ), and I plan on using the other leftover broth to make either brown rice or quinoa. Looks fantastic, I will give it a try this weekend. I came across your seitan sausages using a steamer and was wondering….. Could you use a steamer to make other seitan alwell? Surely the only difference between them all is shape? I’ve never used or owned a steamer and before purchasing wanted to have more than one reason – seitan sausages – of having it! So yeah, this is my third comment, but I tried the recipe with chickpea flour (as the recipe states) instead of the yellow split-pea flour, and the texture was COMPLETELY different. It was more tender, had less chew, and was much more like commercial seitan. I feel like the flavor of the broth soaked into this batch more than the other — it was more porous and a tad bit spongier. When I sauteed the fresh seitan in a pan, it was crispy on the outside and juicy on the inside — good deal! I am still crafting the perfect mock jerk chicken, but the batch made with this seitan is the clear winner at this point. It was VERY spicy, but man was the texture great! I am starting my own blog soon, so I will write more about it there. Look out for http://www.veggiesoulsista.com! Delciious! I swapped out onion powder for asofoeteida because I have an intolerance to FODMAPS. But your recipe is awesome. Thanks for sharing it! This tastes amazing!!! Thank you! Does it freeze well? the recipe is not showing up on the new website. I swear if its because you want people to buy your recipe book that’s really stupid. It is showing up. And your comment is extremely rude and disheartening. I’ve shared recipes online for free for over a decade. Stuff like this makes me not really want to. So how about be a nice person and don’t spoil things for others? I too am having problems with the recipe showing up. I tried using firefox, safari, and chrome on my computer and then tried using my phone as well and nothing’s working! It would be lovely to make this recipe, could someone help? I just sent an email, but now that I’m at the bottom of the replies, I see that I’m not the only one who can’t see the recipe. I tried on ipad, iphone, and computer. Not showing. Sorry and disappointing to see “admin” respond so aggressively. YEA!!! today the recipe is showing up for me. I think this is going to be amazing. I’m steaming mine (because apparently I’m incapable of simmering based on past attempts). Thanks for your sharing ,useful for me . Its because you want people to buy your recipe book that’s really stupid.! The directions confuse me. How much of the 8cups of broth are used in mixing with the dry ingredients and how much is used to simmer? I can t see thew recipe!